Assistant Commissioner John O’Driscoll said in many of these circumstances offenders were found with weapons and wearing balaclavas. GARDAÍ SAY THEY have saved lives in more than 30 circumstances since the gangland war in Dublin’s inner city erupted last year. Speaking today as he announced the addition of 57 gardaí and six sergeants to special crime operations units, Assistant Commissioner John O’Driscoll said increased resources in the force in recent years have had a significant impact. “The restructuring in the organisation has resulted in a situation where we are more often involved in intervening and preventing loss of life than investigating the loss of life,” he told reporters. O’Driscoll said the more-than 30 situations where gardaí prevented the loss of life were “not just ordinary run-of-the-mill interventions and the handing of forms to people and giving them notification of the fact that their life is in danger”. In many of those circumstances the intervention has involved discovering people who are so ready to conduct or to implement the actions that they intend in terms of murdering that they have guns in hand, weapons in hand, and they are dressed for the occasion in balaclavas or whatever and that clearly has provided us with a significant challenge. He said there were a number of occasions in which the same individual’s life was threatened. “It is down to the dedication and the professionalism of the members concerned that such a number of interventions have been made,” he added. So far this year, three assault rifles, two submachine guns, six semi-automatic pistols, 10 revolvers and two shotguns have been seized in operations involving the Drugs and Organised Crime Bureau. The assistant commissioner said there is a growing number of charges before the courts relating to conspiracy to murder, a charge that has not been as common throughout the force’s history of dealing with crime. Though O’Driscoll noted there had been “significant impacts” on An Garda Siochána throughout the recession, he said it has now “turned a corner”. Email “Gardaí have prevented more than 30 gangland shootings since the feud erupted”. 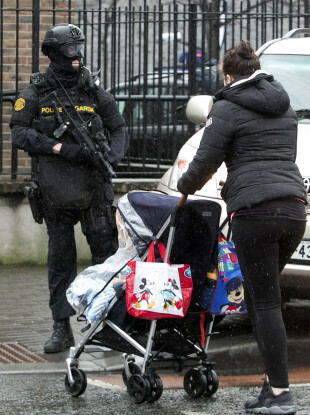 Feedback on “Gardaí have prevented more than 30 gangland shootings since the feud erupted”.